MELVILLE, N.Y., July 2, 2013 – Canon U.S.A., Inc., a leader in digital imaging solutions, today announced its parent company, Canon Inc., developed Dual Pixel CMOS AF, an innovative new autofocus technology for the EOS 70D Digital SLR camera. Dual Pixel CMOS AF, a phase-detection AF technology conducted directly on the image sensor plane, employs a CMOS sensor on which all of the effective pixels are able to perform both imaging and phase-detection AF simultaneously to achieve dramatically improved AF performance over prior EOS cameras during Live View and video shooting. As digital SLR cameras have evolved in recent years in terms of functionality and performance, shooting styles have become more diverse. An increasing number of users no longer rely exclusively on the viewfinder when shooting, but rather view the camera's LCD monitor when using the Live View function to capture still images and when shooting video. Canon's newly-developed Dual Pixel CMOS AF is an innovative new image-plane phase-detection AF technology that employs a CMOS sensor on which all of the effective pixels are able to perform both imaging and phase-detection AF simultaneously. Each individual pixel (the smallest structural unit capable of outputting an image signal) on the CMOS sensor incorporates two independent photodiodes (elements that transform light into electrical signals) which output signals that can be used for both imaging and the phase-detection AF. When using the EOS 70D Digital SLR camera's Live View function, the technology enables autofocusing with ease, flexibility, speed and accuracy similar to shooting through the viewfinder, enabling sharp focus to be obtained across a wide shooting area through phase-detection AF until final focus is achieved. Compared with earlier generations of Canon's image-plane phase-detection AF, Dual Pixel CMOS AF realizes shorter focusing times, outstanding tracking performance and smoother autofocusing during video shooting. And, because Live View shooting can be used in a manner similar to using the camera's viewfinder, the fast and smooth AF performance allows users to concentrate more attention on the subject and composing the photo when shooting. Compared with the EOS Rebel SL1, which employs Hybrid CMOS AF II, the EOS 70D Digital SLR camera (scheduled to go on sale in September 2013), which is the first camera to feature Dual Pixel CMOS AF, not only achieves AF speed that is approximately 30 percent faster but also delivers improved Movie Servo AF tracking for continuously smooth focusing during video shooting, even when filming quickly moving subjects. Because the outstanding AF performance of Dual Pixel CMOS AF is made possible with 103 models of EF lenses (including many earlier models and models available outside of Japan), users can enjoy a wide range of photographic endeavors achievable with various lenses. Recognizing great potential for the application of this technology across diverse product categories, Canon aims to promote its development efforts in the field of AF technology, targeting further advances to contribute to expanding the world of photographic expression. How Dual Pixel CMOS AF Works. With conventional phase-detection AF, the light that enters through the photographic lens is divided into two images. The difference in the focus point position between the two images is measured on a dedicated AF sensor rather than the image sensor itself, enabling the camera to determine the direction and amount of lens adjustment required to obtain proper focus. Because phase-detection AF enables fast focusing performance compared with contrast-detection AF, the technology is widely employed in digital SLR cameras, mainly for viewfinder shooting. Dual Pixel CMOS AF employs the same measurement principle as a dedicated AF sensor, except that it is carried out directly with the image sensor. Its large coverage area enables smooth and reliable image-plane phase-detection AF for both still images and video with no reliance on dedicated AF sensors or contrast-detection AF. Contrast AF is an autofocus method employed in compact digital cameras and video camcorders, as well as conventional digital SLR cameras for Live View shooting. Because contrast is highest when an image is in proper focus, the camera analyzes the contrast information from the image on the image sensor, adjusting the lens until the maximum contrast value is reached. While contrast AF offers high focusing accuracy, it tends to require more time compared with phase-detection AF because the focusing components of the lens must be driven during AF measurement to find the point of peak contrast. Hybrid CMOS AF is an AF method employed in the EOS Rebel T5i Digital SLR camera and the EOS M digital camera that delivers enhanced focusing speed during Live View shooting and when shooting video. 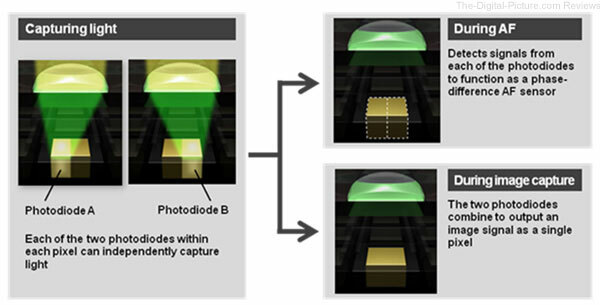 Combining fast phase-detection AF and high-accuracy contrast AF, Hybrid CMOS AF makes possible faster focusing performance than contrast AF alone, quickly measuring the subject distance using a dedicated phase-detection AF image element embedded in the CMOS image sensor and completing the process with extreme accuracy using contrast AF. The EOS Rebel SL1 camera features Hybrid CMOS AF II, which makes use of an imaging sensor that supports AF across a wide area spanning approximately 80 percent of the shooting area measured vertically and horizontally.